Rumors of a 7" iPad have been rampant for months, but this week they’ve really picked up steam as stories at the Wall Street Journal and Bloomberg have all but confirmed it. But despite everyone calling it "the iPad Mini", I remain unconvinced. A 7" iPad has never made sense to me for one reason and one reason alone: interface. While the above image is not a perfect representation of what a 7" iPad would look like compared to the current one, it should be close enough to reveal the inherent drawbacks in scaling down the iPad’s UI by 55%. Tiny text, tiny buttons… The iPad interface would feel cramped and claustrophobic scaled down to a device less than half its size, same pixel dimensions or not. Even if it were technically usable, I cannot see Apple willingly compromising on how it feels to use an iPad merely because it would be cheap and possible. It’s because of the UI problem that I’ve never been able to imagine how Apple could go about pitching a 7" iPad. Besides being easier to hold and carry thanks to its lower size and weight, what advantages could it have over its larger predecessor? The only possible one I could think of would be reading plain text, like Kindle or iBooks, but that would mean any book created with Apple’s iBooks Author tool simply wouldn’t work, as they’re designed explicitly for the 9.7" iPad’s dimensions. Besides, Apple has never positioned the iPad as merely a consumption device. Whether you agree with them or not they truly see it as the future of mass-market computing, and as such I have a hard time believing they would put out a new product with the iPad name that didn’t have the same creative potential as their current one. 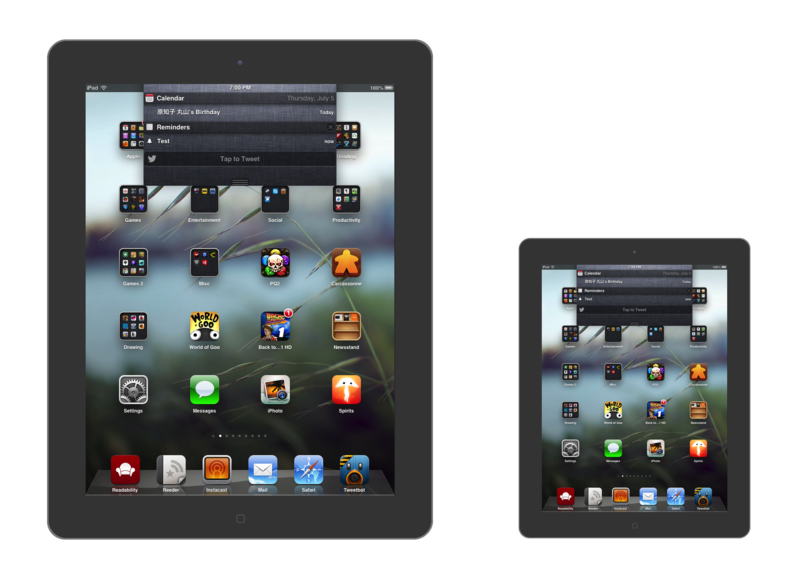 No, a 7" device is not the right place for the current iPad’s interface. A 7" iPad would have to be better than the current one in some key software areas, and right now I don’t see how that’s possible. Yet the rumors of a 7" tablet coming from Apple have only continued to get stronger. How do we explain this discrepancy? The more I think about it, the more I think these rumors are right, but we’ve all been interpreting them the wrong way. The new 7" iOS device supposedly coming this fall is not an iPad Mini. It’s a giant iPod touch. If we consider the ramifications of Apple scaling up the iPod interface instead of scaling down the iPad one, everything starts to fall into place. Instead of feeling cramped, the iPod interface would have more room to breathe. Instead of tiny tap targets, the new iPod’s would be bigger and easier to hit than ever. It would maintain the Retina display feel because it would be using iPhone Retina display dimensions, something you could not say about a 1024 x 768 iPad Mini. Existing iPhone apps can work unchanged, and developers will have no problem creating new apps because it will be essentially the same resolution they’ve been working with for years. It would avoid all of the problems a scaled-down iPad UI would create and serve to make a device that feels like a spacious upgrade to its predecessor, rather than a cramped downgrade. I say “essentially” because the other all-but-confirmed part of these rumors is that this new device’s screen will be 1024 x 768: in other words, the exact pixel dimensions of the iPad 1 and 2. If this rumored resolution is true it’s understandable that our first guess would be that it’s an iPad Mini… But I think there’s another angle we may not have considered that continues to bolster the case for it being a giant iPod touch. Before this latest round of future iOS device rumors, the hot topic was the next iPhone, which has been widely rumored to have a bigger screen. The rumors currently seem to have settled on that screen having 16:9 dimensions, but before that, the rumor was that it would have a 4" screen. Rene Ritchie of iMore covered many of the possible ways Apple could go about creating a 4" iPhone, and one of them was a phone that added more pixels on every side to match the iPad 1 and 2’s 1024 x 768 resolution. While he ended up rejecting it as unlikely, I think it’s still worth considering, because there’s another possibility with dimensions like that: a virtual bezel. A 1024 x 768 iPhone could continue to use just 960 x 640 of those pixels for “legacy” apps, and the extra pixels could mimic the physical bezel (white or black depending on the phone) when they’re not needed. When they are needed, they could serve as a dedicated notifications area or iAd display, among who knows what other kind of possibilities. Developers could modify their apps to take advantage of the extra space if they want to, but if they don’t the experience of using their app on this new phone would be unchanged. Now, I’m not sure how practical or ideal a 1024 x 768 iPhone with a virtual bezel would actually be. For all I know it may just be too silly or battery-draining to be worth it. But if nothing else I think these ideas show that it’s at least as valid as many other options Apple could go with to evolve the iPhone’s form factor without breaking iOS’s legacy too much. So let’s suppose Apple does this. If they do, and my guess that the rumored 7" iOS device with a 1024 x 768 screen is actually the new iPod touch is correct, this would enable Apple to keep the resolutions the same for both the new iPhone and the new iPod touch, just as they are now. Keeping them united in this way would allow for consistency in every new iOS device besides the Retina iPad and continue to make it easy for developers to target both the iPhone and the iPod. It would enable Apple to keep using the same 326 PPI display used in the current iPhone, only cut a little larger to 1024 x 768, just like the rumored 7" iDevice’s screen could keep using the same 163 PPI display from the 3GS as per Gruber’s speculation. And it would explain why Apple would unveil this 7" iDevice in the fall, supposedly alongside the new iPhone: because it would be an extension of the smaller-screen iOS family, not the iPad’s large-screen one. While iOS may have lots of apps for creating your own content, this isn’t to say Apple doesn’t also believe in enjoying media. They do, and the iPod has long been proof of that. In fact, the iPod’s entire raison d'être up until the iPod touch and the App Store was to function as Apple’s best-of-class media player. Yet the iPod hasn’t gotten much love in recent years, and its sales have fallen to reflect that fact. Last year was the first time Apple didn’t hold its traditional September media event, and in turn the iPod touch was the only iOS device that failed to receive an update: as of today it’s still on the comparatively-ancient A4. This has led some to wonder if this is the year that Apple finally kills the line once and for all. But what if that’s not the case? What if Apple actually has big plans (pun intended) for the oldest member of its post-PC family? A new, larger iPod touch optimized and devoted to media feels like a natural extension of what the iPod has always been about. I can see Apple pitching a 7" iDevice as a great new way to experience iTunes media and iOS games much easier than I can see them pitching it as a smaller iPad that doesn’t do as much as well as its larger cousin. It would also reinforce a clear distinction between every sized screen in Apple’s lineup. Want something that will fit in your pocket and is online all the time? Get the new iPhone. Want a thin, light, easy-to-use computer? Get an iPad. Want something at an affordable price with a nice big screen that’s perfectly suited to media? Get the new iPod touch. Unlike Gruber and Ritchie I have no sources whatsoever, so this idea is entirely my own speculation, and not supported by any evidence other than the current rumors. I also admit that I don’t have the best track record when it comes to predicting future Apple moves. I could be entirely wrong and Apple really is releasing a 7" iPad Mini with smaller tap targets. But: I don’t think so. To me, a 7" iPad sounds like, at best, a user experience downgrade. People might buy them because they’d be cheaper than the current iPad, but Apple doesn’t make cheap things just because they can, or to fill out a market segment. This new device would have to have a strong intrinsic reason for existing beyond merely making money, and it would have to offer a great experience. Non-negotiable. And I think a bigger iPod touch would offer just that. After this post went up I got some great feedback on Twitter from readers smarter and better at math and mockups than me. Among other things, they showed me that my quick and dirty mockup of the iPad Mini in comparison to the current iPad was off by too large a factor: I had inadvertently created one that measured 5.8" rather than 7.85". @alexbrooks and @grt in particular were kind enough to provide me with images that showed what an actual 7.85" iPad would look like in comparison to the 9.7" one. This alone was enough to make me reconsider my position that a smaller iPad would be a non-negotiable compromise in user experience, but it was MacRumors' Arnold Kim and his link to his site's 7.85" iPad mockup meant for viewing on an actual iPad that led me to conclude that I was probably wrong. If MacRumors' mockup is accurate, an iPad Mini at 7.85" would only be a slight reduction in screen size from the current iPad, and the touch targets for most apps would almost certainly remain usable at current iPhone and iPod touch sizes. So while I personally don't see the appeal of an iPad that is almost-but-not-quite as big as the current one, based on these mockups I can concede that such a 7.85" iPad Mini would be up to Apple's usability standards. If, in fact, that's what's actually coming. Despite all the articles and rumors and discussion about this smaller Apple tablet, the fact is that right now few if any of us outside of Apple know for sure what the device's size will be. And if there's one thing I've learned in the time since this post was published, it's that there is a surprisingly big difference between 7" and 7.85". Specifically, the difference between a giant iPod and a smaller iPad. An iPad Mini at 7" is inconceivable for all the reasons I describe above, but an iPod touch at 7", with a resolution of 960 x 640 and a 163 PPI screen, would make even more sense than it would at 1024 x 768. Just like making a 7.85" iPad at 1024 x 768 would enable Apple to scale the iPad UI down cleanly, so too would a 7" iPod touch at 960 x 640 enable them to cleanly scale the iPod up. By doubling the size of the current iPod's 3.5" screen, the same number of pixels would all be there, just at twice the size. I have to admit that if Apple's new tablet is a giant iPod touch, this would be a much more sensible way to do it. So here's my new prediction: whatever this fabled device turns out to be will depend on its screen size. 7.85"? It'll be the smaller iPad. 7"? The new iPod touch. As to which I think it'll be? I have to disagree with myself from yesterday and say that I now think the iPad mini is more likely, if for no other reason than because that's where the growth potential lies. It took me a long time to come to terms with this because for a long time I thought a smaller iPad would never happen, but between the increasingly strong rumors, the plausible mockups, and knowing that Apple wants, nay, expects the iPad to become the computing platform of the near future, it just makes too much sense to ignore. So while I'm leaving my previous post up unedited as a snapshot of what I used to think (and because I still think it's an interesting idea to consider) as of now, I'm joining Team iPad Mini.